In summer 1937, renewed tensions between Japan and China escalate into open war: The Second Sino-Japanese war has begun. Order of Battle comes back to the Pacific Theatre, covering one of the cruellest but most underrated conflicts of the Second World War period. Japanese armies have been reinforced with several new units including biplane fighters and bombers such as the Ki-10, D1A and A4N1, the Sōkō Sagyō Ki flamethrower-equipped engineering vehicle and Type 89 medium tanks. The Chinese rely heavily on foreign arms deals, resulting in a diverse arsenal made up from Soviet Polikarpov fighters, Tupolev bombers and T-26 tanks, German Panzer I's, Sdkfz 221/222 armoured cars and 37mm PaK guns, Italian L3/33 tankettes, British Gloster Gladiators and many more. Nations now also have access to Cavalry units and Horse Transportation for towed guns. In total, almost 100 new unit types have been added to the game. Construction Group unit allows players to construct small airstrips on locations of their own choosing. Horses: These brave and loyal animals played a vital role in the war, and are now included in the game as part of Cavalry units and Horse Transportation. New terrain types: Plow through muddy Rice Fields and fight along the Great Wall of China. 80% - Order of Battle: Morning Sun is unquestionably a success. Order of Battle: World War II is breath of fresh air for all strategy fans. It is a game that takes wargaming to a new level by upgrading every single game element and rebooting the genre for a new generation of players. Detailed terrain, rich animations and a slick interface, all within a traditional setting and with the elements that are familiar to experienced players - Order of Battle: WW2 follows in the footsteps of all time classics, such as Panzer General. 28 JAN 2016 Order of Battle: Morning Sun is released! With a Twitch Stream! 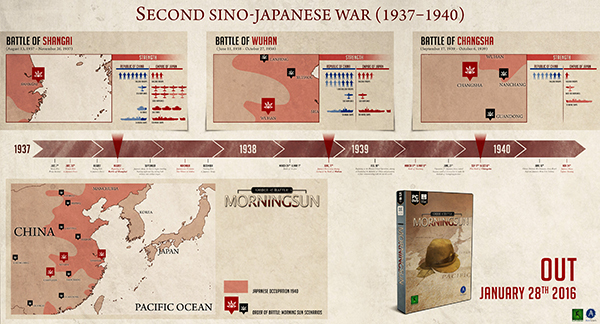 15 JAN 2016 Order of Battle: Pacific - Morning Sun release date revealed! 29 OCT 2015 Order of Battle: Pacific - Morning Sun is looking for Beta Testers!